Included in the definition of an active and involved dad is a father's willingness to set aside his own needs for the good of his family and his children. 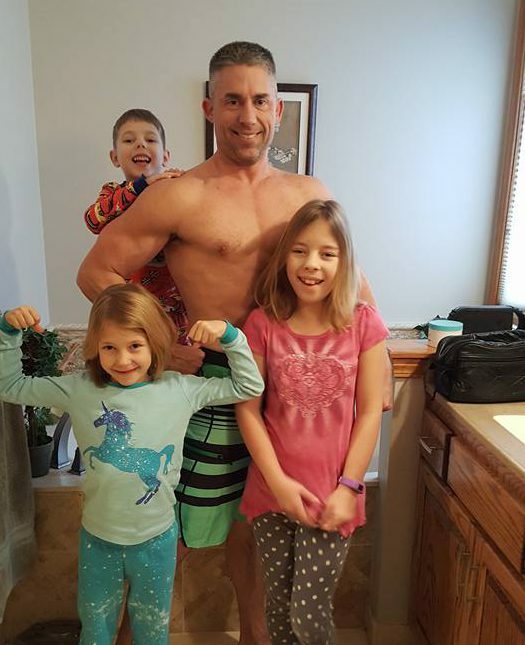 This month's Featured Fit Dad, Bret, was an air traffic controller for 10 years, has an International Business Degree and a Master's Degree in Aeronautical Science. But these days, as Bret puts it, he earns a salary "that consists largely of hugs when my children feel like giving them." That's because not long ago, Bret decided to quit his job and stay home with his three children and home school them while his wife pursued her career in air traffic control management. Coinciding with this "career change," came Bret's commitment to his health and fitness - to the point that he has now stepped on stage in a physique competition and placed. Bret's story is an inspiring one, proving the value of a father putting his family first. I began my fitness aspirations at around the age of 25 after being dumped by a girl who wished to have a relationship that involved a guy who went to the gym…and who also wasn't me. After much soul searching, I decided that I needed to work on myself. The areas I chose to improve upon were physically (body), spiritually (soul), and intellectually (mind). Easy solutions…go to the gym, school, and church. Easily executed plans? Not so much. My fitness portion of the improvement triumvirate had many ups and downs. Most of them, looking back at it now, were due largely to the nutrition factor of the equation. I used to enjoy a lot of alcoholic beverages and a lot of cake…muffins, pies, pastries, etc. A couple of years ago, I finally saw the light and realized that a diet consisting of the bad things was working in direct opposition to what I was trying to achieve in the gym. I started monitoring what I ate with myfitnesspal.com and hired a coach to help me with advice and macros. I competed in my first physique competition in October of 2016. I lift heavy things up and then put them down. I dabble in the sports that my children participate in…soccer, basketball, rock-climbing. I also like to do an exercise called "macing." Macing consists of swinging around a metal bar that has a weighted ball at one end. It's a lot like swing an ax around. Macing works all areas of the body for a total workout and looks insanely cool. For sure, it was competing in a physique competition and the treats (shout out to Cheesecake Factory) that I ate afterwards. The feelings of accomplishment were just tremendous. I also scored fifth place in my Physique open class which was a complete surprise and a wonderful achievement for my first competition. My favorite body part to work out is chest. I like the burn that it gives. My least favorites are legs and abs because I feel that I have the toughest time activating those muscles. They are so young and do not really notice the changes that I have gone through. However, I would hope that they see that they can be confident in themselves. I hope that I can show them that practice, consistency, patience, and persistence do pay off - that if you want something badly enough to work at it, there’s nothing that you can't do. Just realize that it is not easy. It is not something that you can work at just a little bit. You can't get fit and healthy in a week or a month. What you can do is take small steps towards it. You can change something today and then develop a habit over a month. Once it's a habit, you'll wonder how you ever did it differently before. Change more and more things, develop more and more healthy habits, and soon YOU will be changed. And it is worth it!